Not far away (~40 km) from Sodankylä Geophysical Observatory is the Lampivaara Amethyst mine. This is the only amethyst mine in Europe. It is possible to visit the mine and pick over the rubble from the operations to try to find your own amethyst, which is lots of fun. Also fun is the way from the visitors carpark up to the summit of the hill where the mine is located. 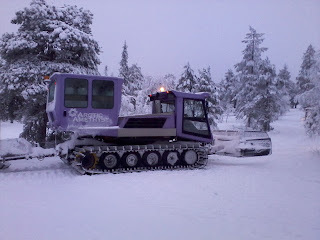 This is a snow tractor and trailer. Can we have one for KAIRA? Please?